Photo Gallery - portsmouthgardenclubs jimdo page! Cut Flower Arrangement (1st Place) entered in the Cut Specimens Category in the 2014 Newport Flower Show by Lynne Jackson DaRos. The Portsmouth Garden Club is involved in many activities that occur throughout the year such as Flower Shows, Workshops and Tours as well as Civic Beautification Projects. We show our support for our State Flower Shows through attendance and event participation. 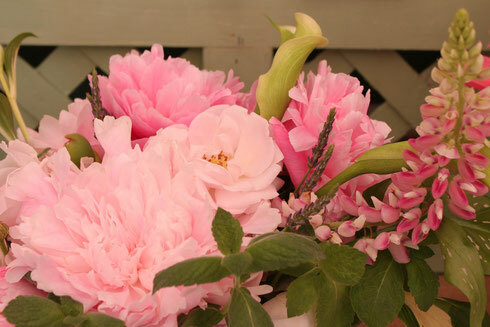 Throughout the year, our members enter their award-winning arrangements to the Rhode Island Spring Flower and Garden Show that is held in Providence, RI and the Newport Flower Show organized by The Preservation Society of Newport County, Newport, RI. Over the past several years, we have hosted, along with Atria Aquidneck Place, the Portsmouth Garden Club Flower Show which is a non-juried show held in May at Atria Aquidneck Place, Portsmouth, RI. We invite you to view the photographs of our events and endeavors by clicking on the choices from the left-hand bar.